Wildlife on the Galápagos is under a new threat. The scientific group that has helped to preserve the islands’ giant tortoises and other unique creatures is on the brink of closure – because of a row about a gift shop. Local traders have objected to the Charles Darwin Foundation running a souvenir shop at its research station at Puerto Ayora on Santa Cruz island. They claim it was siphoning business from their own shops and in July local officials, backed by the government of Ecuador which owns the Galápagos, ordered the station’s shops to be shut. The impact for the foundation – which carries out wildlife research in the Galápagos and provides key scientific advice on protecting wildlife there – has been devastating, its executive director Swen Lorenz told the Observer. “The shop provides us with about $8,000 a week in income from the sale of souvenirs to tourists. Losing that key source of funds was bad enough but it has also affected other donations. People don’t see why they should give us money if the Ecuador government will not support us by letting us run a gift shop. “There has been a dreadful chain reaction following the shop’s closure and we have run out of cash.” The foundation is now two-and-a-half months late with salaries for its staff and some projects have had to be suspended. One key staff member has already left. The Galápagos are an archipelago of volcanic islands in the Pacific, 560 miles west of the coast of Ecuador, and are renowned for the species of birds and reptiles unique to the islands. These creatures include the marine iguana, the only species of iguana that can forage at sea; the Galápagos giant tortoise, the world’s largest tortoise species; and the Galápagos hawk. The islands also played a key role in helping Charles Darwin to formulate his theory of natural selection. On his round-the world voyage on the Beagle, the young biologist stayed on the islands for a month in 1835, noting the subtle variations in species from each of the islands. In particular, Darwin was fascinated by differences in colour and beak shape in the islands’ mockingbirds and finches (now known as Darwin’s finches), observations that played a critical role in developing his evolutionary theory. In the 20th century the Galápagos became a popular tourist destination and the islands have suffered from persistent problems associated with the introduction of pests and loss of habitat. The Charles Darwin Foundation has played a key role in helping the islands overcome these threats – for example, in setting up a breeding programme for several of the islands’ different species of giant tortoises. The foundation was also involved in eradicating feral goats from several islands where herds had stripped them of their vegetation (CNH Tours editor's comment: My husband was in charge of that project). Once these goats had been removed, giant tortoises could then be reintroduced to their former habitats. However, new threats continue to bombard the islands. The latest, said Lorenz, is a recently introduced parasitic fly, Philornis downsi, which is devastating bird species – including Darwin’s finches. The fly lays its eggs in nests with incubating birds and its larvae feed on the blood of the nestlings, sometimes causing up to 100% chick mortality in a particular nest. At least 16 of 20 song bird species only found in Galápagos are now threatened. 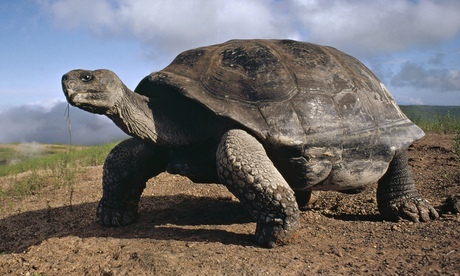 “This is another very serious threat to the wildlife of the Galápagos,” added Lorenz. “We have developed a strategy to deal with it, but it is touch and go whether we will be in existence long enough to implement it.